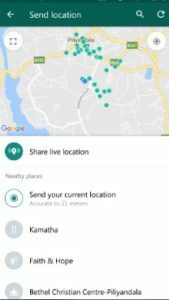 The New WhatsApp Live Location-Sharing Feature Is Rolling Out To Android Devices. This New Feature Allow Users To Share Real-Time Location With Contacts Either Individually Or In Group. Contacts With Whom You Are Sharing Live Location Will Be Able To Track You In Real-Time On Map. Users Can Set Duration And Can See All Shared Locations In Contact Info Or Group Info. 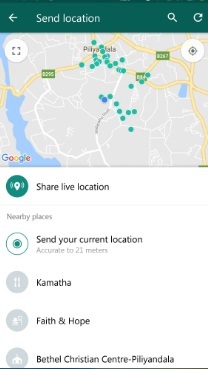 You Can Get Summary Or Stats Of Live Location Sharing In Privacy Settings i.e. Sharing In 1 Chat And Name Of The Chat. You Can Stop Sharing Your Live Location Any Time. To Share Your Live Location With Someone On WhatsApp, Go To The Chat Or Group Chat >> Tap On Attachment Icon >> Choose Location >> Share Live Location. That’s It. This Feature Is Currently Rolling Out To Beta Version Of WhatsApp. You Can Update WhatsApp Beta Version Or Enroll In WhatsApp Beta Program To Check Out This Feature. If Not Enabled, Then Wait.